Click below the Picture to read a article from the Charlotte Observer about Flair's Birthday. Credit on the article goes to Tom Sorensen. What do you get the man who has everything, has done everything, and to be him, you have to beat him? 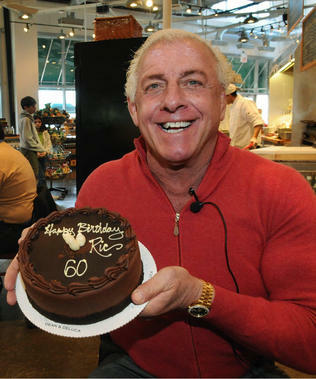 I get a chocolate birthday cake with "Happy Birthday Ric" on top and "60" beneath it. Love the cake. But hoped 60 would be bigger. Hoped 60 would be big enough to see from a low-flying plane. We could get everybody in the restaurant to sing "Happy Birthday." "You do," says Ric Flair, "and I'll never talk to you again." The Nature Boy has turned 60. "Can you believe it?" asks Flair. The year Flair was born, Harry Truman was president, 31-year-old Billy Graham completed a hugely successful tent campaign and Sam Snead won his first Masters. The most popular movie and record were  oops, movies and records had not yet been invented. Does this mean you are now the Nature Man? "Does that mean I'm going to grow up anytime soon?" asks Flair. "I feel like I'm 25. That's the problem." The problem is to feel 60 when you're 25. We open the white box at Dean & Deluca at Phillips Place, the restaurant Flair chooses for the interview, and carefully extract the dark cake. Customers see "60" and express surprise. "I don't feel any different," Flair says when he returns, almost everybody in the restaurant watching him. "Sixty doesn't bother me. Fifty didn't bother me. Forty did because somebody told me I'd have to stop wrestling." Flair still works for WWE in public relations, but you know he'll wrestle again. Nobody has ever done it, professionally wrestling, as well. Here is what 60 looks like. Flair's face is tan, his hair is blond and he's in shape. He weighed 232 pounds when he wrestled his last match, and on Tuesday he weighs, pre-cake, 233. He works out at least four days a week and bench presses 300 pounds. He wrestles with his kids, David and Reid. It's not, however, like horsing around with your kids in the living room and letting them jump onto your back from the top of the sofa. David and Reid wrestle professionally. Flair has four children, three grandchildren and a deep sense of peace. "Charlotte's amazing," he says between bites of cake. "Isn't it amazing? And it just keeps getting better. The respect people have for me, the way they treat me  I wouldn't leave it for the world." The only other athlete/icon I've encountered who so willingly embraces fans and signs autographs is Richard Petty. Flair is not introspective. He won't wake up this morning and look back. He admits he could have made better decisions and saved more money. "But what would I do with it?" he asks. "At the end of the day, I'm the happiest man alive." Ever tempted to lie about your age? "Never," says Flair. "Isn't that funny? I'm at ease being myself. I never had to be anyone else."